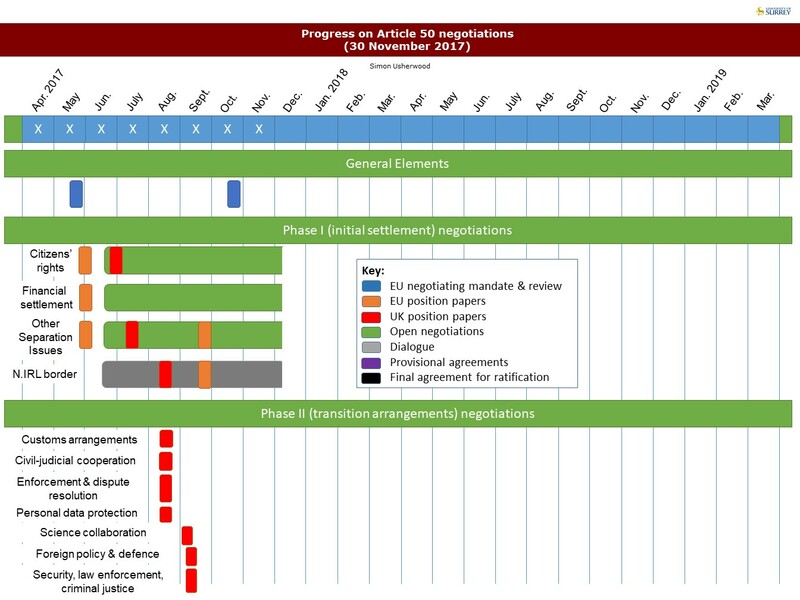 The past week has seen a flurry of activity on Article 50 negotiations, as the various parties race to make progress in time for consideration by the December European Council: it is likely that the next week will see further developments on this front. 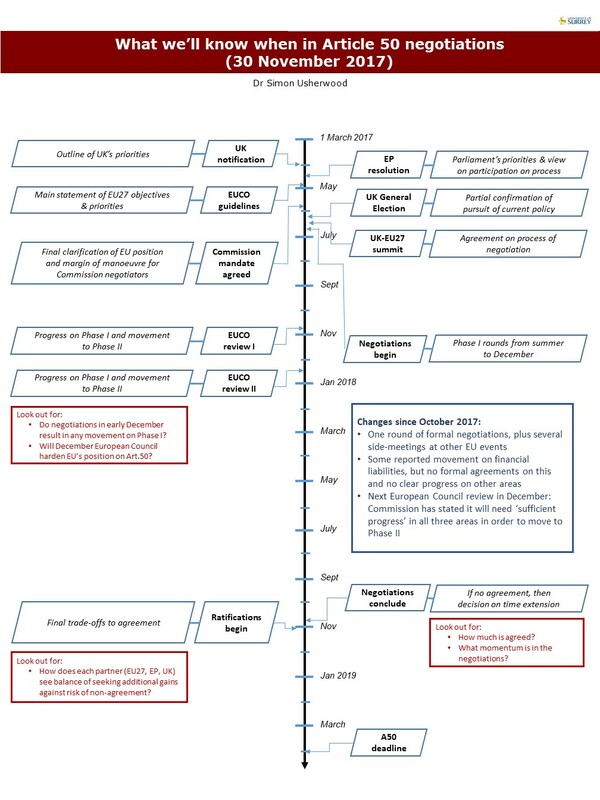 However, seen in the round, the past month has done little to change the chances of reaching an agreement by next October: after the blockage around the last European Council, this period could only reasonably be expected to have got things back on the track they’d been on. 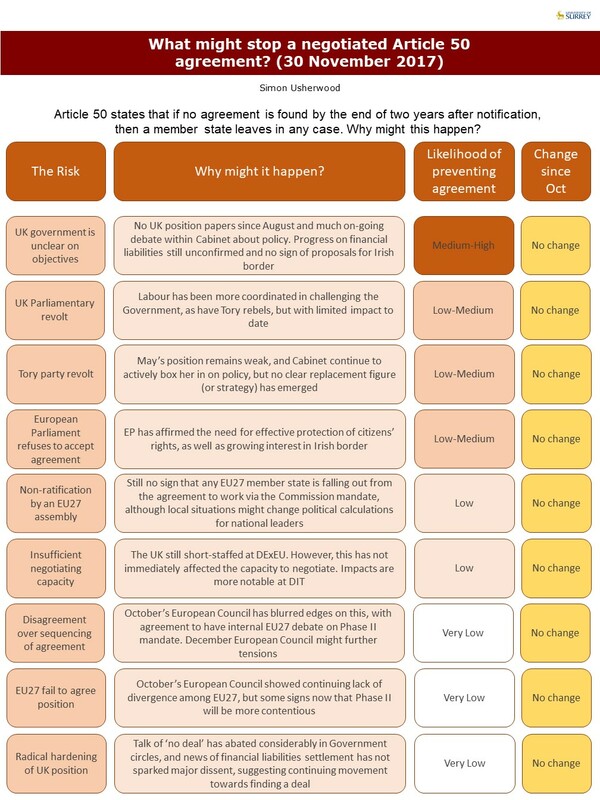 As such, the estimates I’ve given in my graphic on barriers to agreement remain unchanged again this month: I probably under-estimated them last month, so this is a bit of a correction. Overall, I’d put the chances of a final deal at about 60%, although much will hang on the extent to which the EU27 work together to protect Irish interests (see my thread from yesterday). If the December European Council can’t agree the opening of Phase II, then the situation will become very much harder, especially if the UK then rows back on the finances. As ever, please do share these, and point out any and all errors. In other news, tomorrow I will be taking up the position of Deputy Director of UK in a Changing Europe. I’ll still be based at Surrey, but will organise a series of events around the country (if you’d like us to visit you, then drop me a line), as well as doing a bunch of other out-reach and dissemination activities, plus some original research. And no, it won’t change me or the work I’ve been doing up until now. Sorry.